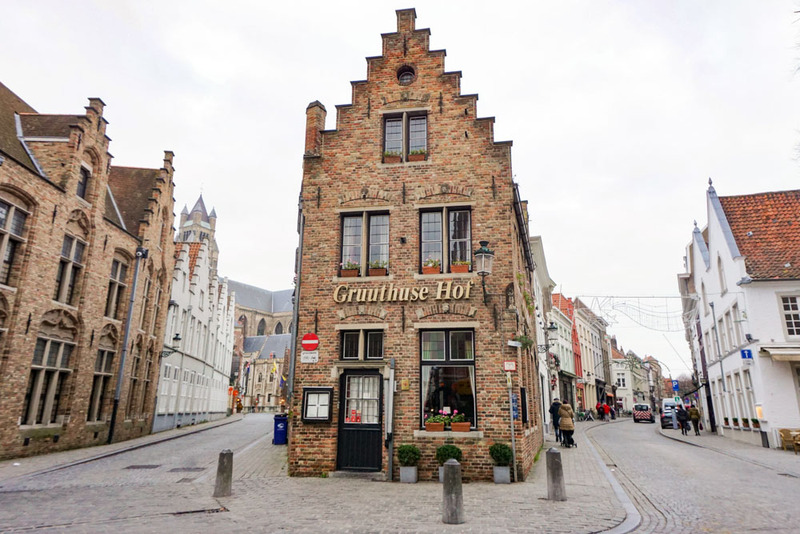 I’m calling this article “What to do in Bruges in One Day,” but I literally mean 24 hours in Bruges, not a day trip to Bruges (or Brugge in Dutch). I truly believe some places are deserving of an overnight trip at minimum, and Bruges is one of these. It pains me to even suggest 24 hours or one day in Bruges, because that’s about how long I was there, and I left feeling like I wanted to stay another week. Or perhaps just move to the story book town. **This post contains affiliate links. I may make a small commission from these links at no extra cost to you. 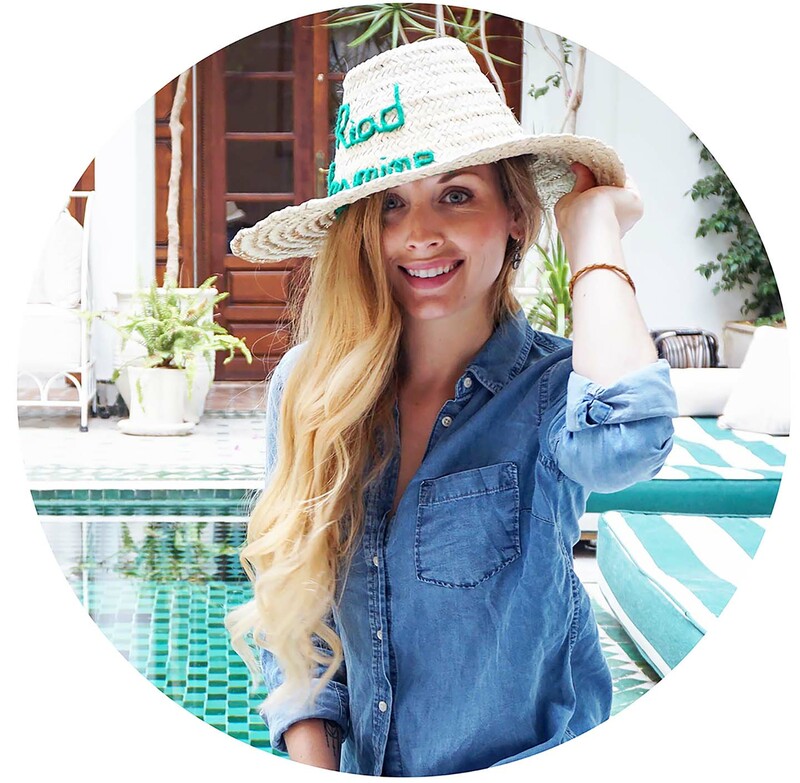 Thank you for supporting bloggers! Read my full DISCLAIMER. Bruges, Belgium should be on your “must see” list for European cities. Hardly a city at all, and more of a medieval village, Bruges city center was designated a UNESCO World Heritage Site and is possibly the most picture perfect town in Europe. The city experienced a golden age from the 12th-15th centuries as a commercial hub with it’s strategic trade access. Many elements of the medieval city, often called The Venice of the North, have been well preserved and the architecture displays different stages of history. Despite having been occupied by the Germans in both WW1 and WW2, Bruges emerged virtually unscathed. 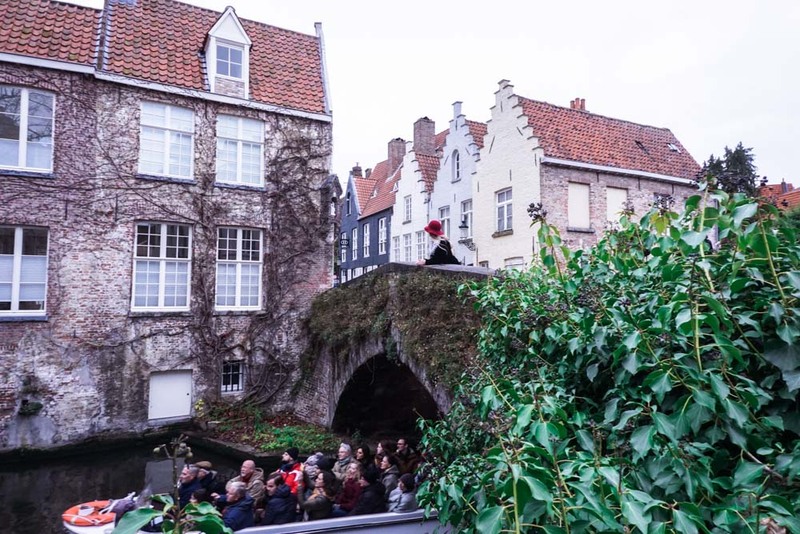 And thank goodness, because now we can enjoy being transported back in time, or perhaps into a fairy tale, to enjoy this well preserved piece of historical magic, even with just one day in Brugge. I’d barely had the town of Bruges on my radar prior to this past year, let alone Belgium (with the exception of their chocolate and waffles). But I figured being a small country, I could see a couple of it’s cities and visit a couple favorites (Paris and Amsterdam) in the same Christmassy trip. 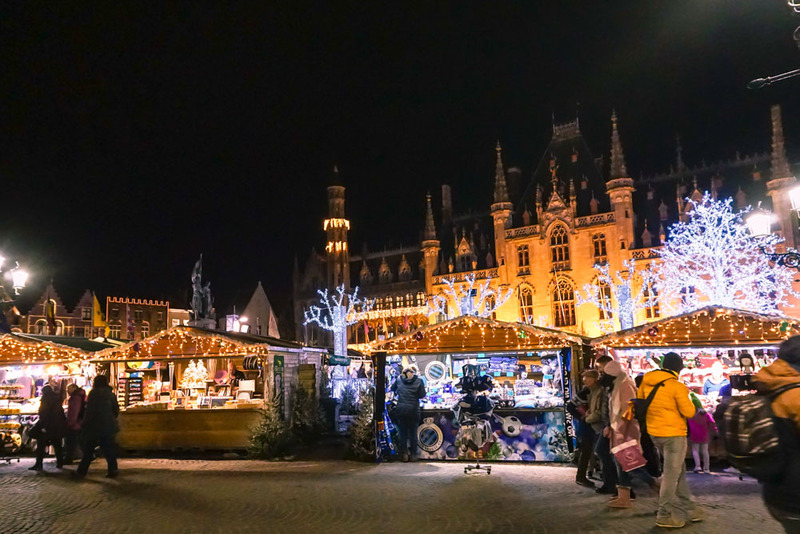 To read about the Bruges Christmas Market, CLICK HERE. Little did I know, Bruges would be the place I fell in love with most and dream of going back to. The following Bruges travel guide should help you make the most of your first time in Bruges in a day. 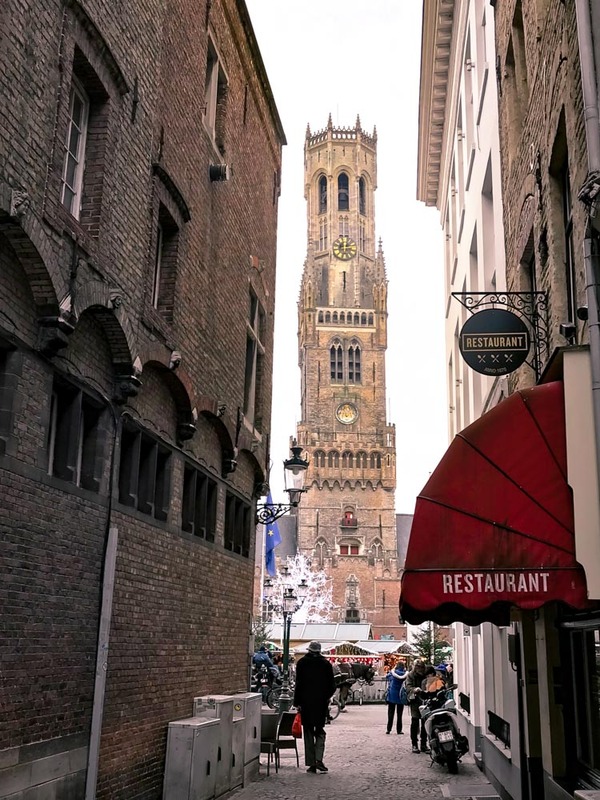 As an added tip, there are plenty of things to do in Bruges in winter as well. You can drive to Bruges and limited parking is available outside the city center, but I suggest arriving by train. 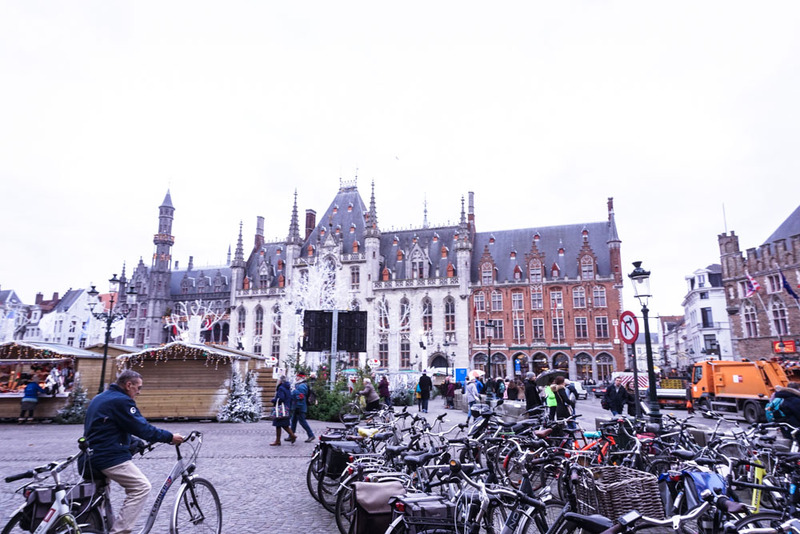 It is easy to get from Brussels to Bruges or Paris to Bruges which means it is also well connected to everything else, so train is the easiest and fastest way to get there. Intercity trains arrive from Brussels, Ghent, and Antwerp dozens of times per day and travel time is quick, at just barely over an hour (or 25 minutes from Ghent). You can easily connect to Brussels or Antwerp from other major European cities like Paris or Amsterdam via the fast Thalys trains or London with Eurostar. 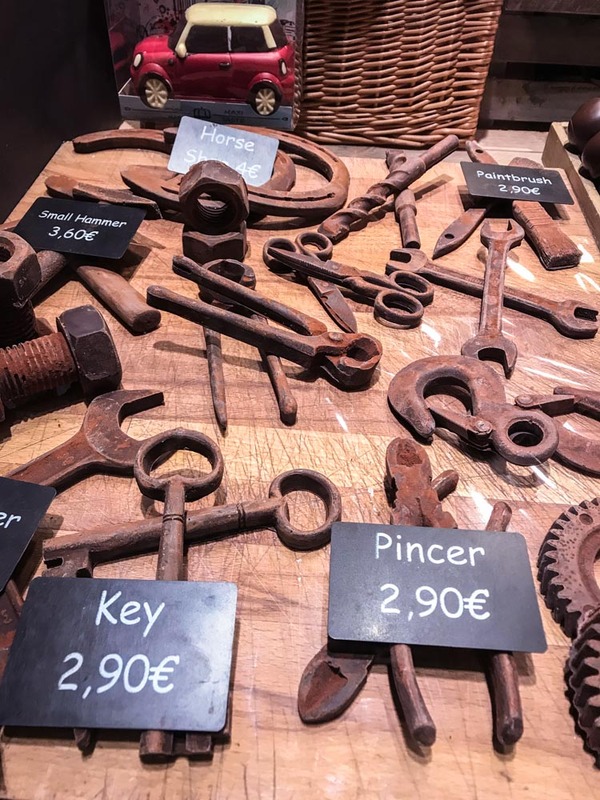 Once you arrive at the Brugge station, you could walk to the Bruges market square/city center in about 20 minutes, but if you have luggage, that is probably not your first choice with all the cobblestone. When you walk out of the train station, there are bus stops. The buses travel to the city center and back every few minutes. You can buy a €3 ticket from the kiosk outside, and you’ll make it to the square. Buses that say “Centrum” on top go to the Bruges market square which is probably where you want to be. For simplicity with luggage, I just hopped in a taxi to my hotel near the square and the ride took about 5 minutes and cost €7. Wanna know where I stayed? You’ll love it too! CLICK HERE. Bruges can easily be walked and the entire old town can definitely be seen in a day if you’re fond of exploring by foot. Biking is also extremely popular, and there are car-free paths meant for bikes. There are a number of bike rental shops or you could take a bike tour like THESE. Or if you prefer to make someone else pedal the bike for you, try one of THESE. If you are a pedestrian and hear the chime of a bike bell, make sure to look around and get out of the biker’s way. Aside from transporting luggage to your hotel, driving in town would not be advisable as a means of transportation. There is a public bus system that goes to all parts of the city from the Brugge train station for around €3. Since 2016, there are also GreenRides, or bike taxis for a great price. Bruges is a very environmentally friendly city. Canal boat tours of Bruges provide a unique (and romantic) perspective that you can’t get from anywhere else in the city and the commentary provides interesting tidbits. From March till November, boats run from 10am to 6pm, however in the winter, tours are dependent upon weather. Apparently frozen canals are not conducive to boats. We got lucky in December and boats were running. There are 5 boarding points and the tours last approximately 30 minutes. Each of those different boarding points are offered by different boat companies, so they are not hop-on, hop-off. Each company has 4 boats (for a total of 20 boats allowed on the canals at once) and the cost is €8. One of the popular embarkation points is Bootexcursies Gruuthuse, boarding point 3, Nieuwstraat 11, 8000 Bruges which is near Church of Our Lady. CLICK HERE for a link to their website and a map. 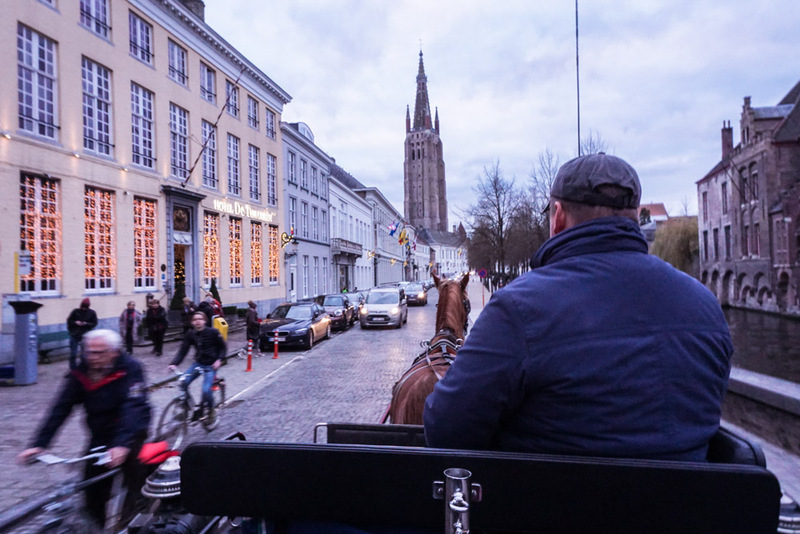 Few things are more romantic that cuddling up in a horse-drawn carriage, riding through medieval streets, the smell of waffles and chocolate wafting through the air. Starting pretty early in the morning and continuing through dark, all year round, you can find the carriages in the market square. They line up and you should approach the one in the front. The cost for a 30 minute ride is a whopping €50 and you have the carriage to yourself (accommodating up to 5). It’s a pricey splurge, especially when the canal tour is only €8. I thoroughly enjoyed it along with the little bit of history that I gathered over the sound of hoofs clicking on cobblestone. Midway through the ride, you’ll stop at the Beguinage, which was a convent founded in 1245 and still inhabited by nuns. Here, the horses will rest and get some food and water for 5-10 minutes. You can walk across the nearby bridge and see the swans. It’s no secret that Belgians know how to indulge. You don’t need to give yourself permission to do the same. This is one of those times you just “DO IT” and ask no questions. 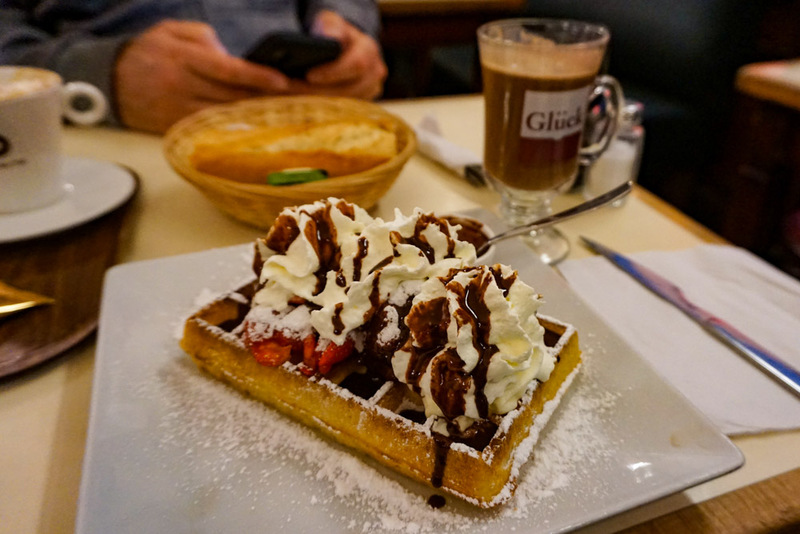 When in Belgium…you eat waffles. Here’s where we need to clear up some misconceptions. There are two types of waffles in Belgium. The Brussels waffle, which is lighter and more rectangular like the one on the left. The other is the Liege waffle, made from a a much thicker, dough-like batter, with chunks of sugar in it, resulting in a dense final product with a crispy, carmelized coating like the one in the photo on the right. The “Belgian Waffle” is really just a simplified American version of the Brussels waffle. There are literally beautiful chocolate shops on every street. I honestly didn’t notice much of a difference between them. But make sure to pop into a tea room for thick, creamy, REAL hot chocolate. The Old Chocolate House is a safe bet. Consider a chocolate tour at the chocolate museum, Choco-Story. 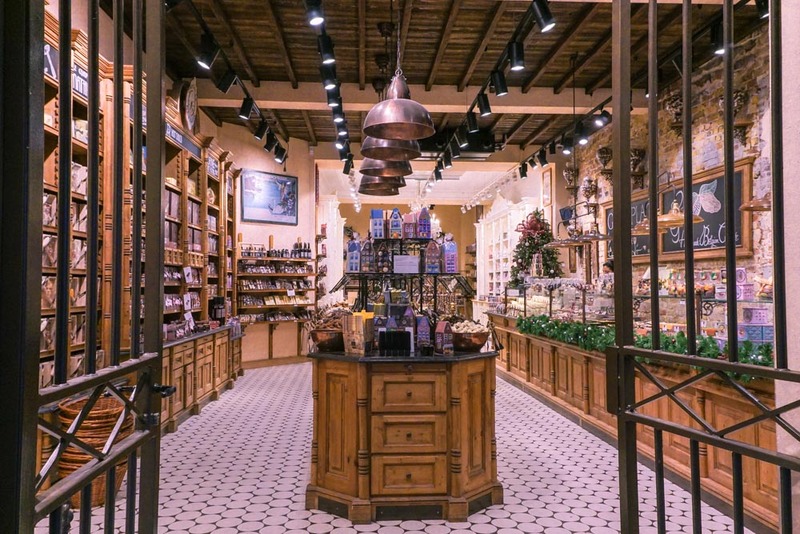 Truly a marvel, you can learn the history of chocolate cultivation and its role throughout history, partake in a workshop, and of course, eat chocolate. I didn’t say it was G rated. 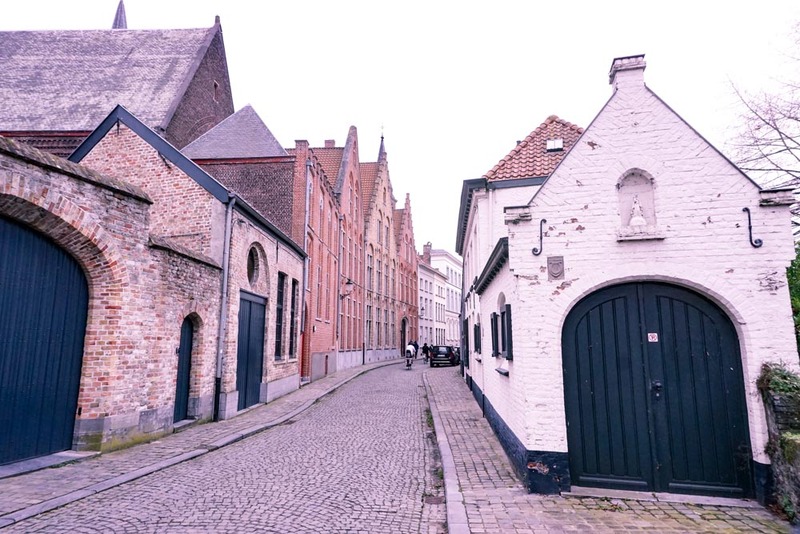 During the golden era of Bruges in the 15th century, there were no fewer than 54 breweries. With the city’s decline, so did the number of breweries. 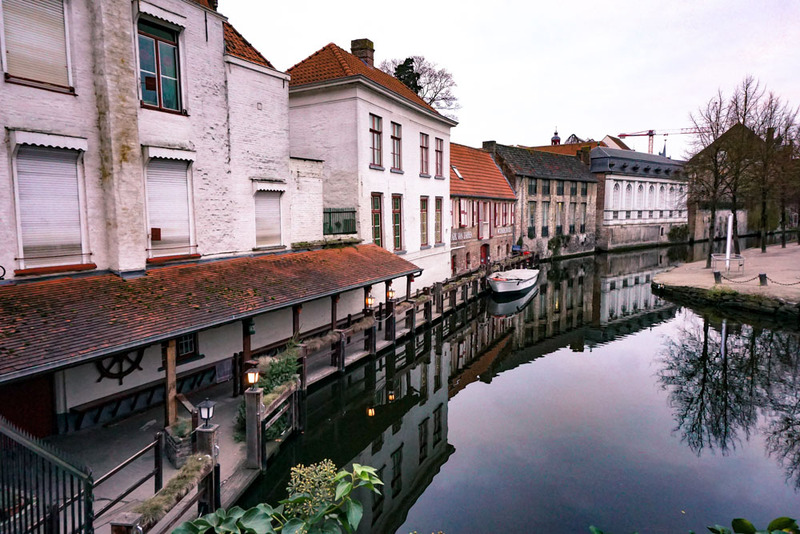 Today, at the time of writing this article, there are only three breweries in Bruges. Brewing since 1856, De Halve Maan offers tours and tasting and since 2016, they have a really unique, 3 km long underground beer pipeline for transporting the beer from the brewery in the city center to the bottling facility in the suburbs. Fries, frieten (Dutch), or frites (French), are a staple of Belgium. Belgians eat their frites typically served in a paper cone, with a dollop of sauce (usually mayo based), using a tiny little fork or their fingers. You can find them at stalls around the market square. Both the Belgians and the French have staked a claim on inventing them. Supposedly, American soldiers during WW1 mistakenly called them French fries because they thought they were in France. This popularized the nomenclature in the US. It’s unclear whether this story is true, but if it is, I bet the soldiers had no idea what the ramifications of that little geographical error would make. Either way, they are damn good. And I don’t have any pictures because I don’t drink beer and I inhaled my fries without a second thought. It seems there’s an overwhelming amount of restaurants, cafes, chocolatiers, yada yada yada. The only thing I can recommend wholeheartedly is a fine dining restaurant, Le Mystique, where I had the best 4 course meal with wine pairings I’ve ever had. 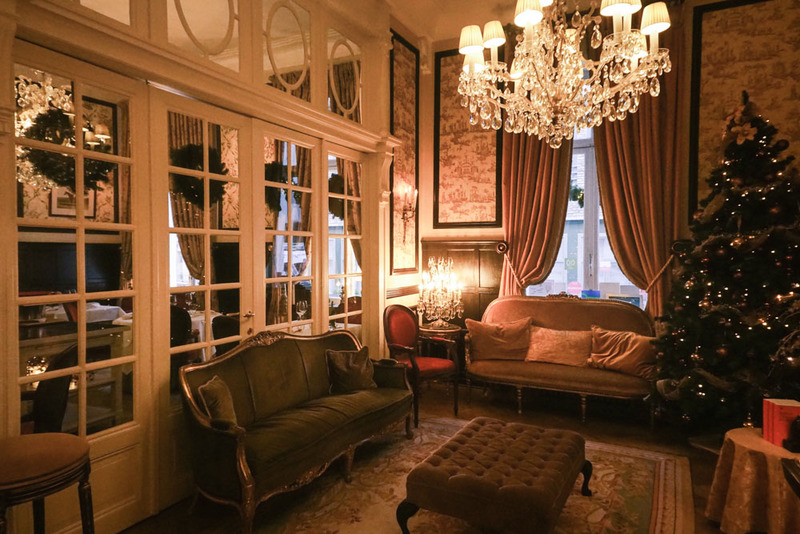 It is set in the luxury boutique Hotel Heritage Relais and Chateaux (which is also where I stayed and I can’t rave about enough). 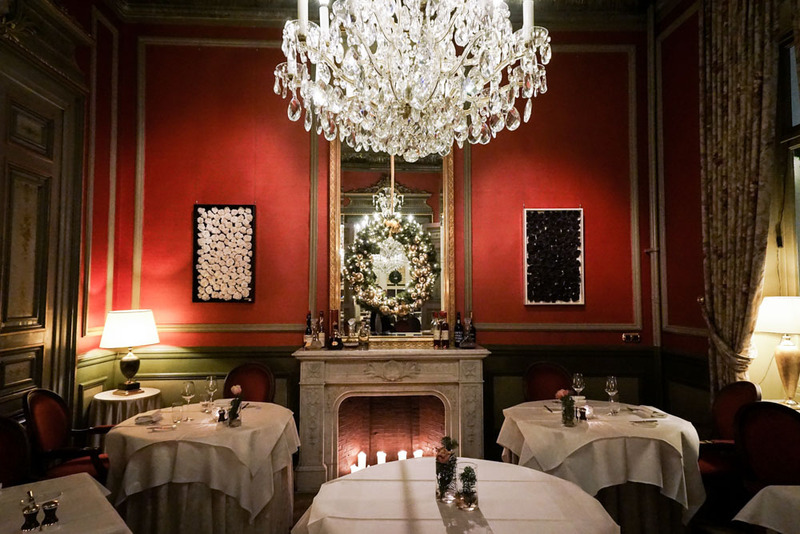 The classical and elegant dining room is absolutely stunning You’ll want to make a reservation ahead. I think it’s obvious that Bruges is beautiful and there’s no better way to take it all in than walking. Plus, you just ate a bunch of waffles and chocolate, so do yourself a favor…get some exercise. It’s easy to see the entire old city center in 24 hours. Every street and canal is magically different. I’ll let the photos speak for themselves. 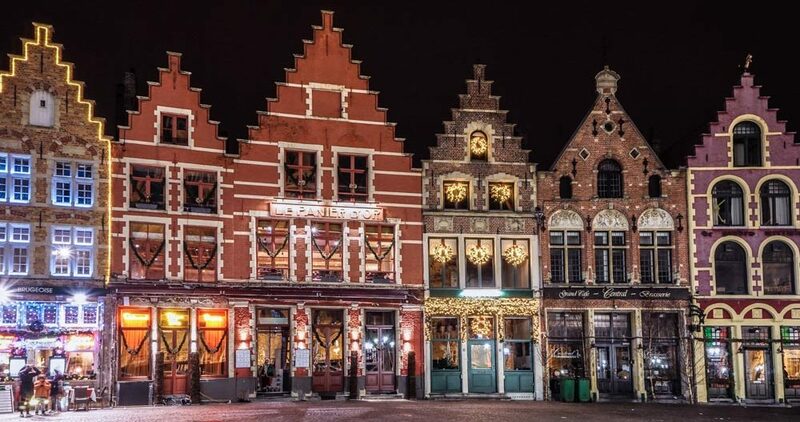 Since I’ve hopefully convinced you an overnighter in Bruges is not only ideal, it’s practically essential, you now have the exciting opportunity to pick from some truly incredible 3, 4, and 5 star boutique hotels for a really romantic Bruges experience. Compare prices, and read what other travelers have to say at TripAdvisor. 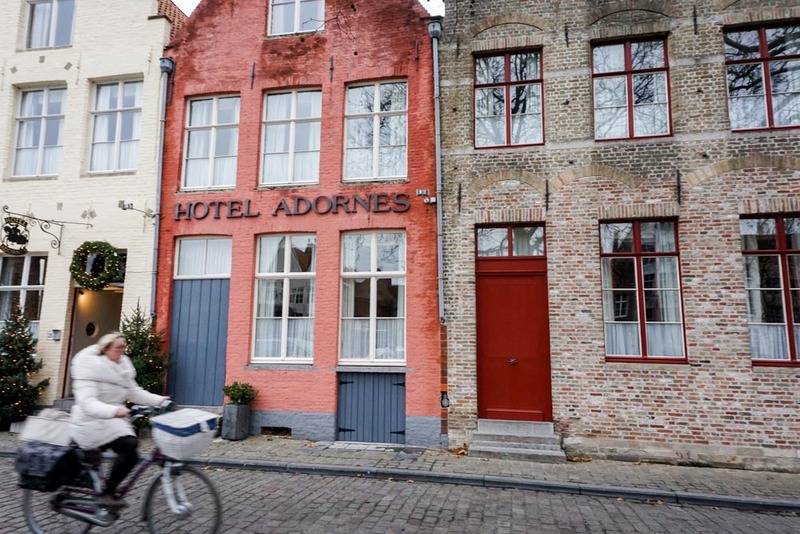 The top rated, best hotels in all of Bruges are pretty reasonably priced. You get a lot for what you pay for. 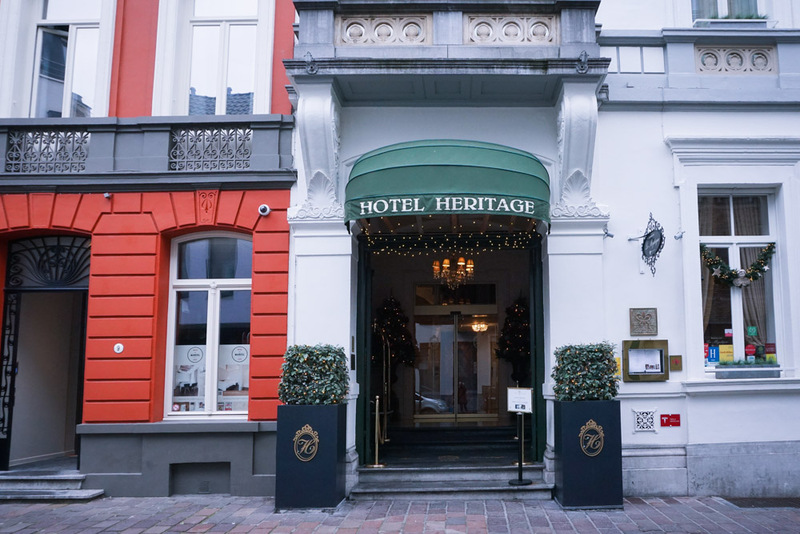 Like I said before, I can’t refrain from singing it’s praises: Award winning Bruges Hotel Heritage and it’s Le Mystique Restaurant are an experience of a lifetime. Read my REVIEW HERE. I truly believe no one could be disappointed with this elegant, historical, and perfectly located luxury boutique hotel. Anytime! High season, of course, is summer. Spring and fall are close seconds. Which is why I’m going to be the oddball and say WINTER is a great time to visit Bruges, when subsequently prices and crowds are down. Bruges has a temperate mild climate by the ocean. Summers rarely get hotter than 70 degrees Fahrenheit (about 21 degrees C). Winters can be bone-chillingly cold, but surprisingly, there can still be beautiful green vines and plants around the canals. 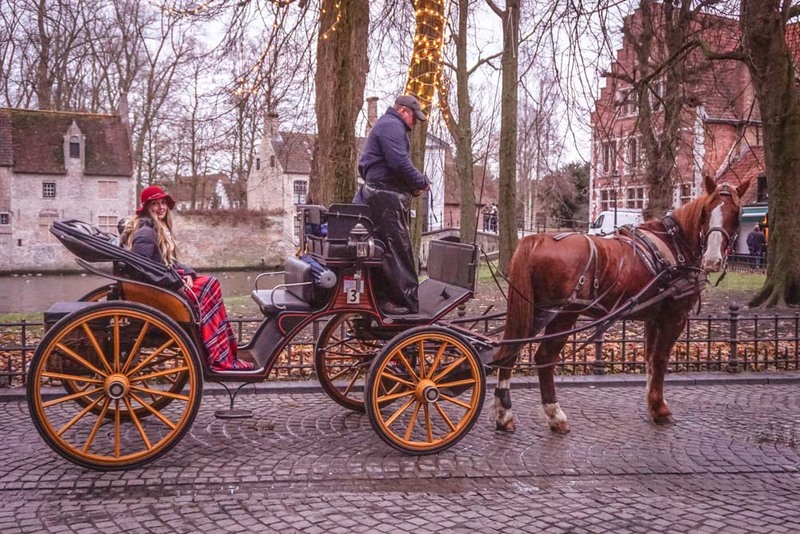 Dress appropriately and you can experience Bruges during Christmas, which is basically like a fairytale on steroids. I hope I’ve given you the necessary help to plan your [overnight] one day trip to Bruges and some activities for an awesome experience in Bruges. If time is a limitation, I will reluctantly agree, a day trip to Bruges is better than nothing at all! A weekend in Bruges would be even better. As much as I was able to see and do in Bruges in one day, I’ll definitely be staying for longer next time! 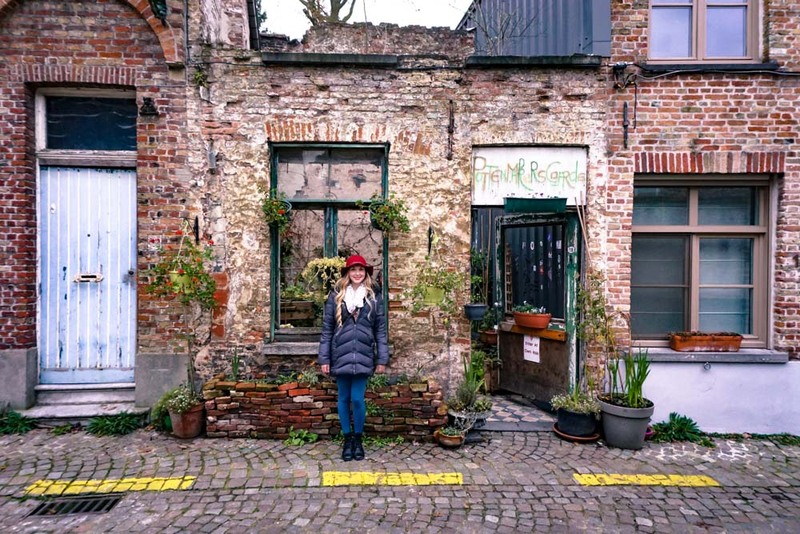 Want to visit other cities in Flanders, Belgium? 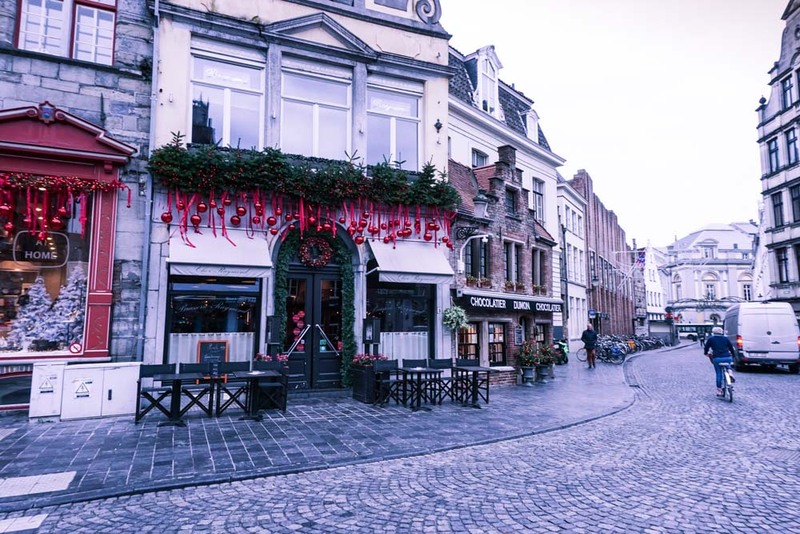 Read this post on The Best Cities to Visit in Flanders, Belgium. 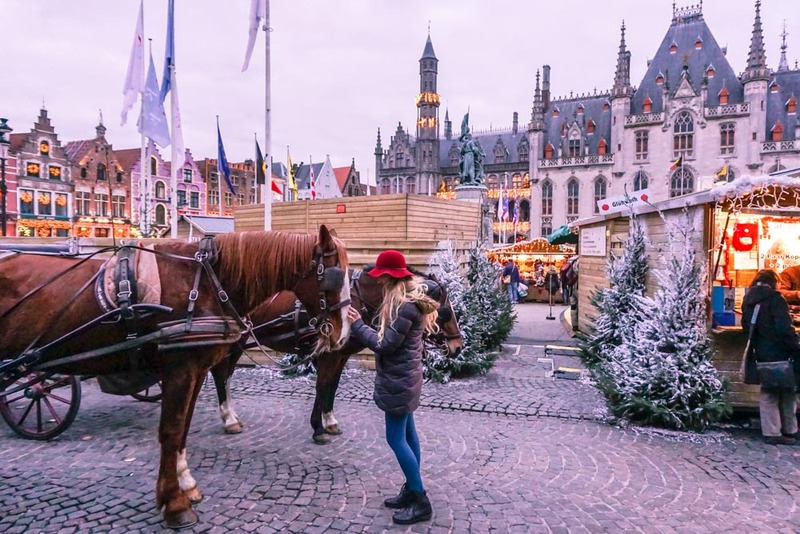 This entry was posted in Belgium, Destinations, Europe and tagged Bruges, Christmas markets, winter destinations by Jessica Carpenter. Bookmark the permalink. Aww, thank you Samantha! I love cities I can see and do a lot in a short time as well. Bruges is a great little town! Aww, what an awesome anniversary spot. Brussels was amazingly beautiful as well. I’m pretty bummed I missed Ghent though. Next time I hope! Belgium is really underrated as a travel destination. Bruges seems to offer a lot to do – I especially like the old alleys, the boat ride under the old bridges and the gorgeous tower. While I’m impressed how real the chocolate tools look, I find the private parts made of candy…disturbing. I find the pornographic chocolate totally disturbing as well! hahaha. Like – why?! Why is that necessary?! Needless to say, I didn’t buy any 🙂 I agree Belgium is totally underrated too. I read this while polishing off my remaining Belgian chocolate from a trip two weeks ago to the Belgian coast from Knokke to Oostende.. I love Belgium, and it’s so very underrated and not visited nearly as much as it should be. How can you not love the architecture, life on the water and, of course the food and beer! I have to say that Ghent has my heart, but Bruges is so very pretty too. And as you rightly point out, there’s so much to see and do in both. Haha, I love your comment! And I agree – totally underrated! I’ve heard great things about Ghent too, and regret not going! Next time I guess. So cool you stayed there too! I loved that hotel! I’m obsessed with Europe during Christmastime. I am on a personal mission to find the most Christmassy magical town, haha. Bruges was a good one. I love the idea of a horse drawn carriage ride. And after seeing all those unique chocolates, I now picture Bruges as a city where everything you see and hold are chocolates. Haha!!! Haha! Like something out of Charlie and the Chocolate Factory! Yes please! This could not be a more timely post. 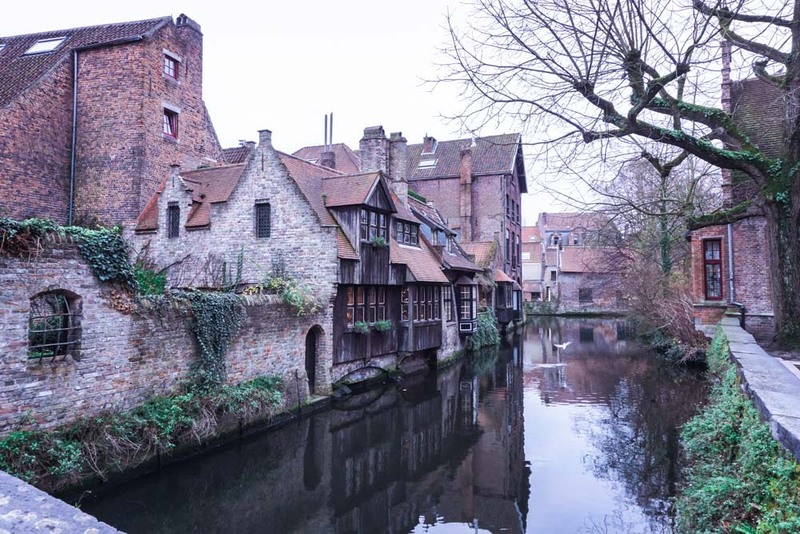 We’re in the process of planning a trip to France with several smaller trips outside the city – and I’ve been contemplating Bruges for awhile, and am now completely sold. Thank you! OH MY GOSH! YAAY! That seriously makes me so happy Meagan! It’s an easy hop from Paris (that’s how I got there too). Have so much fun you two! I’ve known about Bruges being close to Brussels but it still never crossed my mind to visit when in Europe. I’m definitely compelled to do so now though! 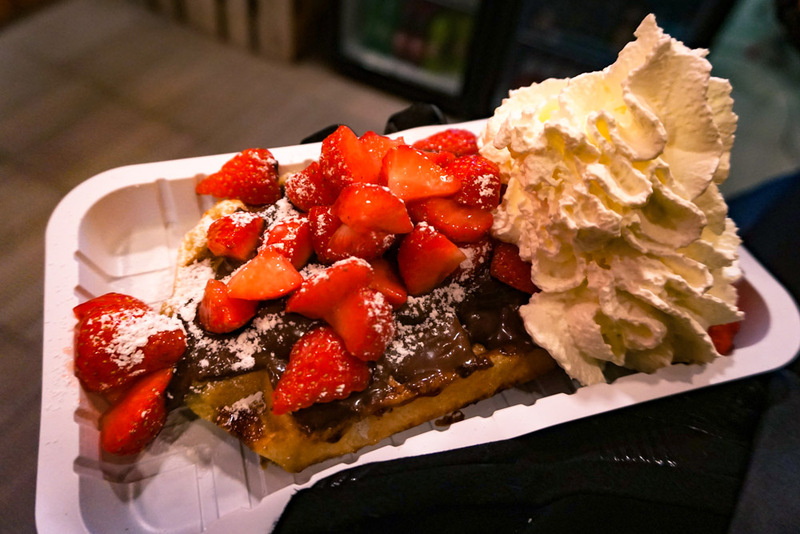 For sure adding the canal tour to my list and you had me at waffles! I personally prefer the airy Brussels one and boy am I just drooling over here! Can’t believe you saw and did so much in such a short period of time. Although you’re right, Bruges deserves more than 24 hours for sure! I’m glad you’ll consider a visit to Bruges now! That’s awesome! I am in love with waffles of all shapes, sizes, and densities, so bring on ALL the waffles, haha! Definitely want to go back in the springtime when there’s even more foliage (and warmer weather!). I was in Bruges a few years back and absolutely loved it! If you have more time, you can bike along canals to the Netherlands and see tons of adorable towns on the way. Love your pictures! You’re making me want to return to Europe! Oh my gosh, I can’t even imagine how amazing that would be to bike all the way to Netherlands. What a great idea! I bet there are so many cute towns. Thanks for sharing this idea, Grace! Thank you Sabine! I’m jealous you are from Belgium. What an amazing country! I have spent a birthday in Bruges a few years ago and loved the city. I was there in summer and really enjoyed the canal boat ride. I’ve only spent a day and a half there but the same as you I had an amazing dinner with wine paring in a really beautiful restaurant (I can’t remember the name but it looked similar with the one you’ve been to). 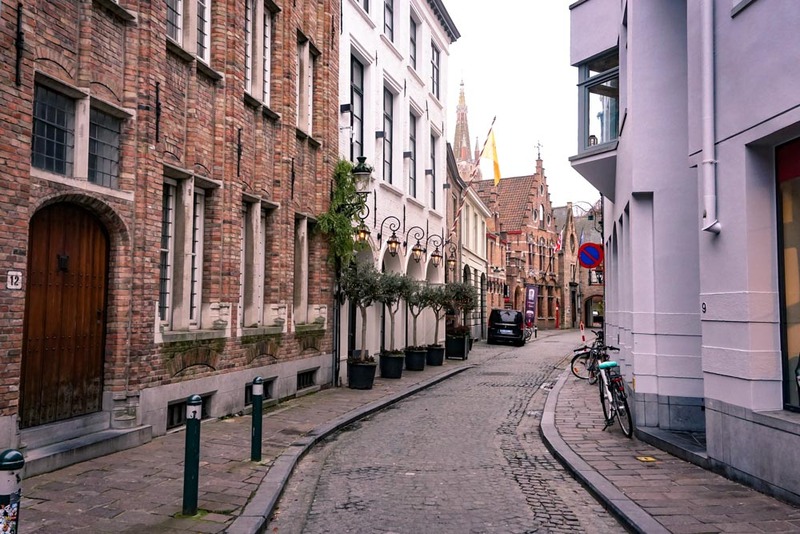 Belgium has never really been on my radar either, but your photos of the streets of Bruges (and of course the chocolate!) have definitely changed that. It looks like a gorgeous place with so much culture to see in such a short amount of time! Great information Jessica. There’s a lot to do in Bruges. I’ve not been but it’s been on my list for a while. I’m saving this so I have this resource when the time comes. By the way, your photos are beautiful! Great, I’m going there in March so this is perfect for my trip planning. Your pictures are amazing and I feel like I’m already there! Ah Bruges! Such a beautiful place and the waffles are totally yummy! I love Bruges! We visited in May last year and had the best time – so much chocolate, waffles, beer and chips. Loved wandering along the cobbled streets and beautiful canals. Amazing how cheap the bus is and OMG what a cute city!! 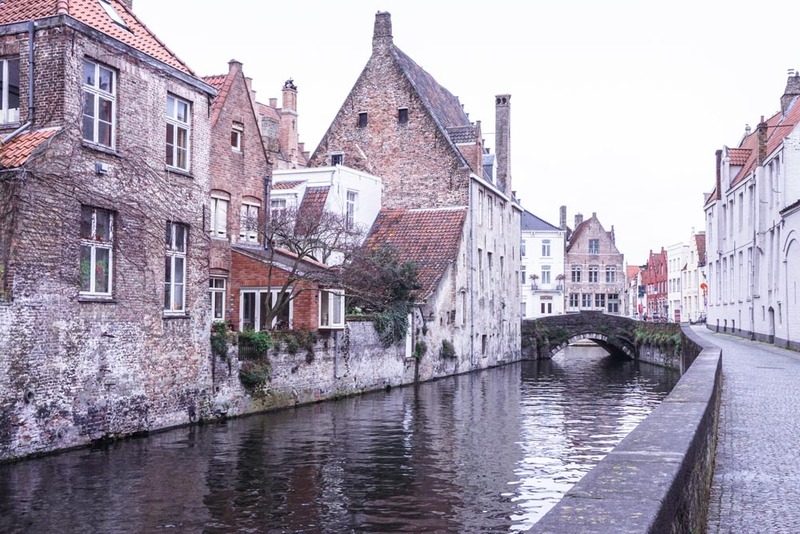 This post definitely made me add Bruges to my list! I was so happy to get your comment this morning! Nice to hear from a fellow Bruges lover. And I had never heard of Lille, France but had to google it immediately! It totally reminds me of Bruges and it’s so close too! Wish I could have made a stop there. Is it a similar size? I love how walkable Bruges is. You should go to Gelateria Da Vinci for the best icecream in the world! Oh that sounds divine! I had my fair share in Italy and never stop craving it! Hi Savannah! I had to really dig to figure out where the shop was where I found those, haha. So I believe it was a place called Verheecke with a red store front. If you find a restaurant called Gruuthuse Hof, walk away from it, down the street facing the front of the restaurant until you cross a bridge. Shortly after the bridge on the right, next to a Subway, you’ll see the red storefront with the chocolate. I am almost positive that’s the store where I took this pic:) Good luck!